Yea, you can carry stuff too... Its like the best of both worlds! Nuthing like wearing a Diaper in public! Last edited by runnriottt on Wed May 06, 2009 5:12 am, edited 1 time in total. WOAW... that Portumac made you look like a bubble head. Good on the switch. Can we see a front shot of you with this new OT helmet? Last edited by runnriottt on Wed May 06, 2009 5:13 am, edited 1 time in total. Good call on the upgrades. You're headed in the right direction! The GH armor was a big improvement, it give your shoulders the correct look. 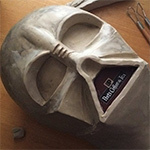 Your Vader is looking very good. Thanks guys... Coming from you all makes me feel good about all the time in the costume. I just need to upgrade the chest box to be more movie size. This one now looks to small. I have just gotten my SA/GT V2, its close to the right size, but now that I have the GH, it just dosent cut the mustard. Looks off. The GT V1 is gone, donated to another Vader. Well, I spoke with TMP, and he said he might make suits if there was sufficient interest (I think he meant like a total of 10 people to get a batch done). So we'll see. PM him over TDF and tell him I suggested you contact him.